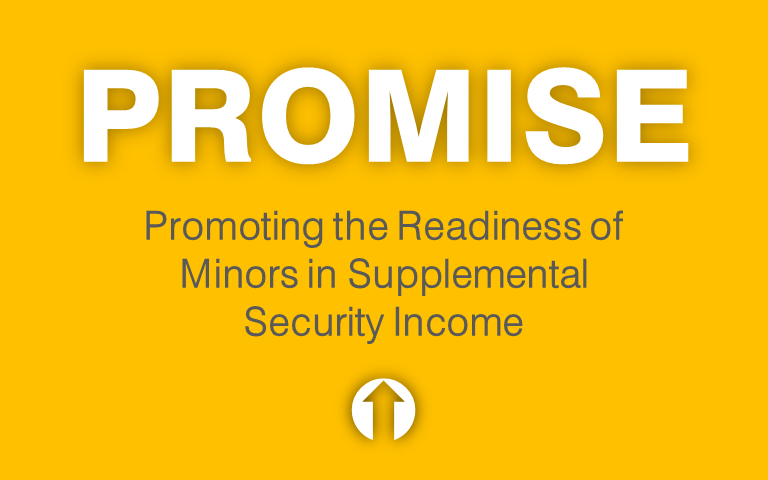 Promoting the Readiness of Minors in Supplemental Security Income (PROMISE) is a five-year research project that advances employment and postsecondary education outcomes for 14–16 year old youth who receive Supplemental Security Income (SSI). PROMISE began October 1, 2013 and will continue until September 30, 2018. The program is an interagency collaboration of the U.S. Departments of Education, Health and Human Services, Labor, and the Social Security Administration. Under this competitive grant program, state agencies have partnered to develop and implement model demonstration projects (MDPs) that provide coordinated services and supports designed to improve the education and career outcomes of children with disabilities receiving SSI, including services and supports to their families. 2017 represents the fourth year of the projects (the first year was primarily dedicated to recruitment and enrollment). Thanks to the ongoing efforts to support families and youth, we look forward to hearing about bright future outcomes for the thousands of youth and families being served by PROMISE. Under the Workforce Innovation and Opportunity Act (WIOA), projects are coordinating with vocational rehabilitation agencies so that youth are receiving pre-employment transition services, to include paid employment. By April 30, 2016, the MDPs recruited a total of 13,444 youth and their families with half of them receiving intervention services targeted around improving outcomes in employment and postsecondary education. Cody is excelling as a student at Burlington High School and employee at McDonalds. He plays video games, rides bike, and is learning to drive and weld. His goal is to be a welder after college. Cody was born with a brain tumor and has just one hand, but that’s not stopping him. He’s a youth with Promise, on a journey to achieve his personal, educational, and career goals. Watch Cody’s story on YouTube. She’s like most #teenagers… she hangs with her cats, dances with her friends, and loves Criminal Minds. She’s also going to have a lung removed. She’s a youth with Wisconsin Promise, on a journey to achieve her personal, educational, and career goals. Xavi shares her dreams, challenges, and the steps she’s taking with Wisconsin Promise to plan for her future. Watch Xavi’s story on YouTube. As someone who expressed an interest in architecture, one of the Arkansas PROMISE youth participants expressed his desire to work at an architectural firm. Working with the local workforce board, Arkansas PROMISE staff set up an interview with a local architectural firm and secured an internship that resulted in the PROMISE youth and the firm staff learning from one another. Watch Dorian’s story on YouTube.